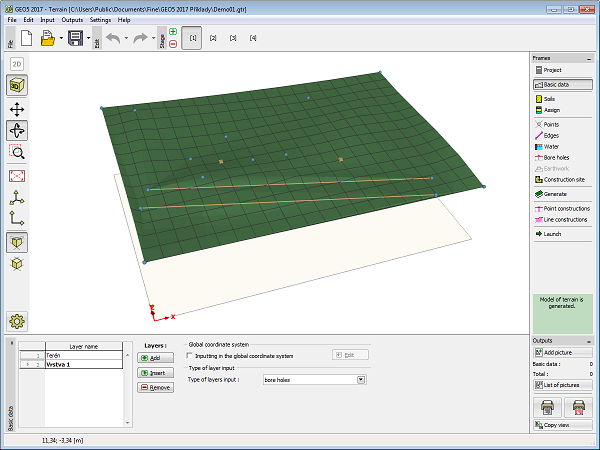 The frame "Basic data" serves to input basic parameters of the task. The frame contains a table with a list of specified layers. Layers can be added, inserted or removed using the buttons on the right from the table. The first layer can be neither removed, nor can another layer be inserted in front of it. Crossing the item "Input in the global coordinate system" opens the way for introducing the data in the global coordinate system (JTSK, Gauss-Krüeger). In the "Type of layers input" combo list it is possible to determine the way of inputting layers. Layers can be introduced with the help of layers thicknesses or their points. In this input regime the assumed setting can be modified only in the first construction stage.